Exactly as needed for shooting. Thick enough, no hard plastic cover and easy to remove when not needed. It's what I was looking for. Top DAA product as usual !!! Perfect fit,protection and elbow movement . Use it for IPSC and rifle shooting. Very comfortable product for rifle shooting. Fits perfect. Protects the elbows. Top! It's very comfortable, I use it for rifle shooting. Great piece of kit. Often knee pads are either too stiff or too bulky and are difficult to wear and move around the range. These are flexible and low profile but still offer a high degree of protection. Un excellent produit pour l'IPSC car léger et néanmoins robuste sans pour autant ressembler à un Robocop des forces de l'ordre. Rapport qualité/prix excellent. Ce ne sont pas les plus résistantes ni les plus protectrices mais à mon sens, c 'est le meilleur compromis pour la pratique TSV/IPSC.Protège largement (frontalement et latéralement) l 'articulation sans gêner les mouvements.Le système de fermeture ne coupe pas la circulation sanguine. Attention: ne résiste pas à la perforation (cailloux saillants ou pointes métalliques) Livrée avec une très utile pochette de rangement ré-utilisable qui se glisse aisément dans le sac de tir. Sehr gut weil einfach mal anziehen Range schiessen und ausziehen ohne Probleme! The new CED/DAA knee pads are contoured into a streamline design featuring EVA and shock absorption materials. Constructed of 1680D polyester fabric on the front panel of the knee pad, with a flexible yet rugged PVC (faux leather) cover pad for additional protection from sharp stones and brass. Quick release and fully adjustable elastic straps are designed to easily connect and disconnect, giving the user fast attachment over the pants when needed for a course of fire. These knee pads are designed by shooters, for shooters. Designed to give you durable, sufficient protection even when sliding to your knees from a full run. Without being too heavy, too bulky or cumbersome. They will offer you the protection you need when going to those low ports, without interfering with your movement through the rest of the stage. Protection of the knee area is vital in preventing injuries. CED and Double-Alpha Academy have teamed up in designing a protective yet very functional product for the competitive shooter today. 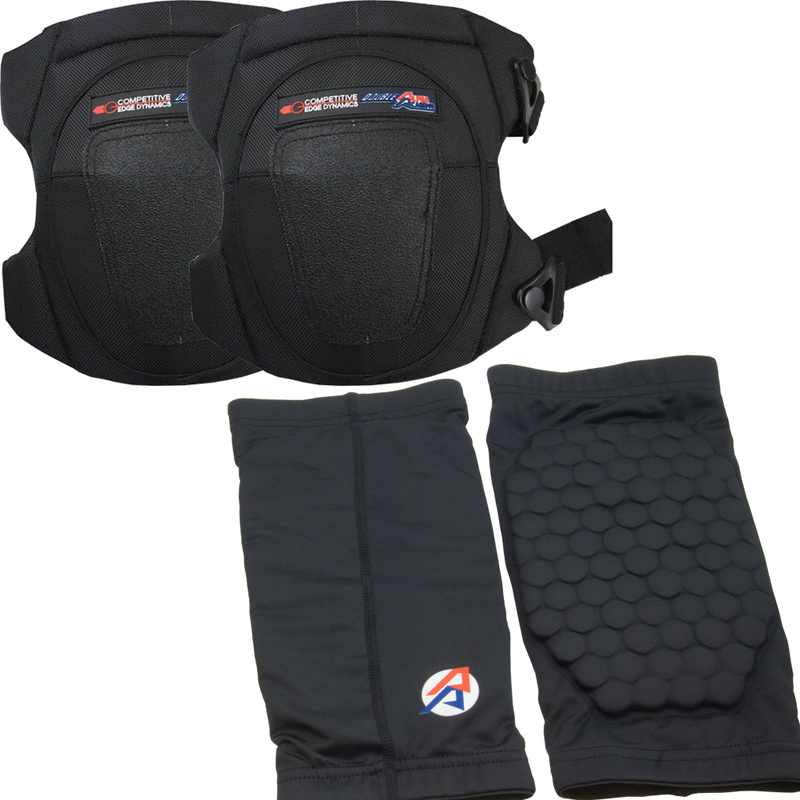 The CED Knee Pad Set consists of two knee pads made with two layers of foam padding assembled into three sections, which in turn allow flexible movement while providing a custom tapered fit. The CED Knee Pads can be worn over pants with easy attachment. No need to pull them over the shoes. The two adjustable straps attach quickly and easily around the leg using Velcro straps. Easy on /easy off!